The Zoe rover was able to detect signs of life at Chile's Atacama Desert as part of a research program to understand how such measurements can be made by remote-operated robots. A robot laden with sensor equipment has detected life on the arid terrain of the Chilean desert, a first for rover-based systems. Nobody was surprise to find life there, but with the harsh conditions and sparse biological activity, the feat is likened to finding microbial creatures on Mars if any exists there. Zoë, a four-wheeled automaton built to scan for living organisms, found evidence of bacterial colonies and lichens living among the rocks of Chile's Atacama Desert. "Our life detection system worked very well, and something like it ultimately may enable robots to look for life on Mars," said Alan Waggoner, an Atacama study team member and director of the Molecular Biosensor and Imaging Center at Carnegie Mellon University. NASA's Mars rovers Spirit and Opportunity are currently exploring the red planet, but they are not equipped to make the specific measurements needed for life detection. Developed by the Carnegie Mellon's Robotics Institute, Zoë borrows its name from the Greek word for "life." 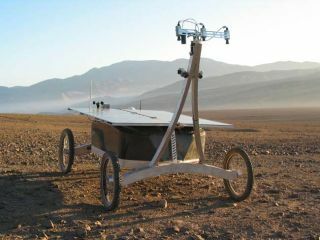 The robot is part of a three-year Life in the Atacama project at the Astrobiology Science and Technology Program for Exploring Planets (ASTEP) to understand how life can be detected by remotely-operated rovers. "We saw very clear signals from chlorophyll, DNA and protein," Waggoner said, adding that researchers also found visual evidence of biological materials from images taken by Zoë's cameras. "Taken together, these four pieces of evidence are strong indicators of life." The research was presented this week at the 36th Lunar and Planetary Science Conference in Houston, Texas. Nathalie Cabrol, a planetary scientist at NASA's Ames Research Center, led the study. Zoë stands just over three feet (one meter) tall and carries a fluorescence imager on its undercarriage to detect chlorophyll-based-life like the cyanobacteria in lichens. The instrument can also pick up signals from fluorescent dyes that light up when they connect with nucleic acids, proteins and other life-relevant molecules. "Our fluorescent imager is the first such system to work in daylight while in the shade of the rover," Waggoner said, adding that sunlight can ruin the light-sensitive life detections. A spectrometer aboard the rover also looked for evidence of chlorophyll in the visible and near-infrared range of the light spectrum. Zoë searched for signs of life in coastal and inland region of the Atacama Desert between August and October of 2004. Researchers controlled the rover from a remote operations center in Pittsburgh, Pennsylvania while a ground team accompanied Zoë across Atacama, retrieving samples of regions where the robot made a life-detection for later verification in a laboratory.